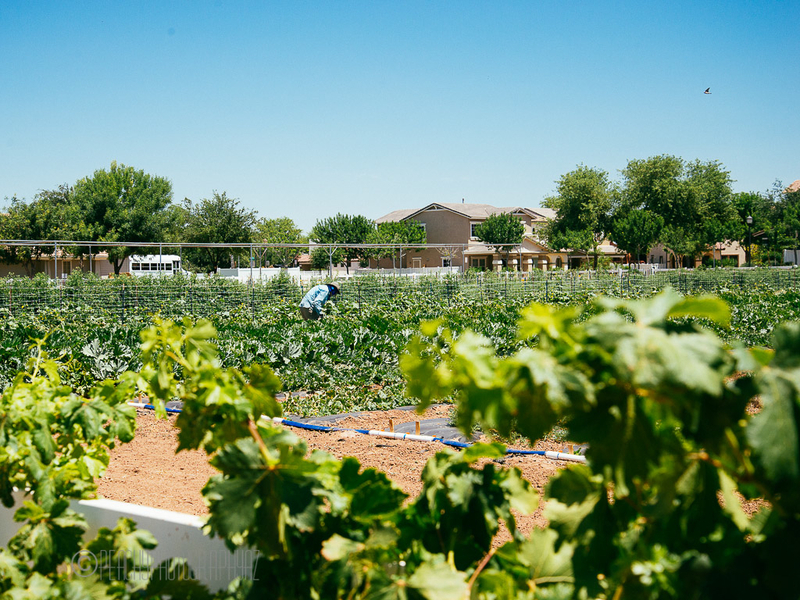 Agritopia is an urban farm and something of a modern village designed to flourish in suburban Phoenix. Launched a decade ago, this pioneering agrihood was developed by the original farming family, and spearheaded by their son, Joe Johnston. As a case study, the Johnston’s story inspires us as farmers to reimagine urban development, land transfer norms, and reframes our role as essential to healthy community design and build-out. Joe is now a proud resident of Agritopia, which includes 600 housing units organized around a central twelve-acre community farm, and a restaurant. 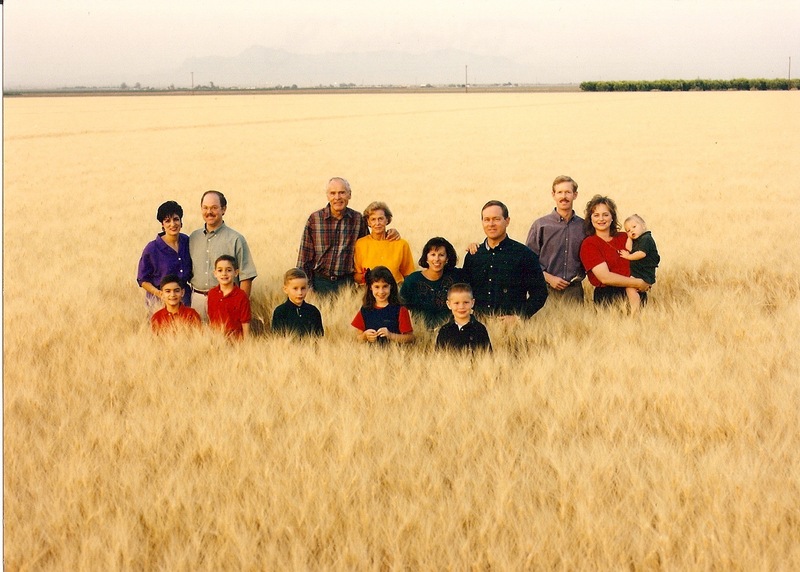 Joe’s family started farming as a young couple on Agritopia’s land in 1960 growing the crops of the day, hay, cotton, and wheat, and selling at the co-op. With Phoenix’s growth exploding in the late 1990’s, the Johnston family was certain development would shortly come their way. They agreed to make a family plan that both preserved the farm and related positively to development forces. Their son, Joe, an engineering graduate from Stanford, loved design and had already started a chain of coffee houses. Joe had a vision to create a restaurant on the family farm serving food grown on the farm. This was the seed idea that was the beginning of Agritopia. Carving out agricultural orchards, 2004. Joe researched analogous models and visited the fabled Fairview Gardens in Goleta, north of L.A., an early model for sustainable urban agriculture amid suburban gas stations and strip malls. Michael Abelman, the Farm Manager, had purchased the land from the original farming family with help from local activists, forming a non-profit, and putting the land in a trust held by the Land Trust for Santa Barbara County. Joe’s most important lesson from Fairview Gardens was to design Agritopia from the ground-up to privilege farm operation, so that the farm could operate free from undue governance models imposed by neighbors who might be intolerant of conditions native a farm such as odor, dust, noise etc. This translated to all Agritopia homeowners signing covenants and restrictions in their original selling documents including the acknowledgement of an operating commercial farm in the middle of their community. The community also requires organic landscaping materials for residents’ lawns. Joe shared the Agritopia vision, “We’re trying to create village life, breaking down barriers to human connection, creating multi-generational living, living with the seasons, living where our food comes from, teaching patience . . . both a modern and traditional life with agriculture.” Residents attest that encouraging sharing, making homes more maintenance free, and having easy pedestrian access to needs, simplifies their lives and creates more time to enjoy friends and family. Outstanding in the Field event, 2014. 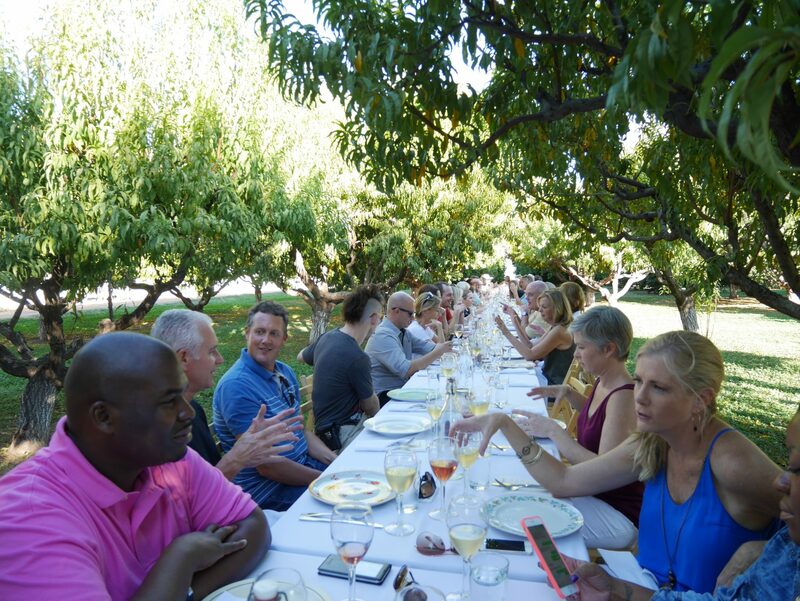 In considering what he’s learned from the farm at Agritopia, Joe shared, “My dad would hate running this farm. He liked being out in the country. Though, if you’re a people person, and if you want to be involved in an urban community, this is ideal. “It’s important to figure out how to make agrihood farming work properly within your environment from the beginning. With regards to farming here, it was much easier in my Dad’s day. There was infrastructure in place to process crops, full technical support from the universities, and we just grew crops of the day. In contrast, what’s been going on here (at Agritopia) is very experimental. The learning curve has been relatively traumatic. As an engineer, I can expect to correct a variance immediately. With farming, there’s a significant time lag. Correction is seasonal. “We’ve had to find our way on many big questions like, what kind of agriculture works in this particular place and in this climate? How can we fully integrate the farm into the community? What are the next best crops to try growing? Agritopia has worked hard to fully integrate the farm and, as such, has responded to related emergent community needs. For instance, a section of community garden with fifty family plots was built at the farm in response to residents wanting to participate more deeply in growing their food. Tending summer crops: tomatoes, peppers, and eggplant 2015. The homeowners can choose to support the farm through our CSA, restaurant, or the 24/7 honor system farm stand, but the farm is not subsidized by the homeowners. Reflecting on how to launch a similar project, Joe was clear. “This really takes a farming family deciding they are dedicated to preserving agriculture. They need to already have land, want to allocate it for heritage purposes, and need to have a desire to stay in the project. This takes patience. “Typically, when the urban development world thinks about real estate, and high-value land, the ‘highest and best use for development’ is decided as the use that will fetch the best profit. Left to the normal development market, agriculture will get pushed out. The rent you can charge for agricultural land is nominal in comparison to developing it. 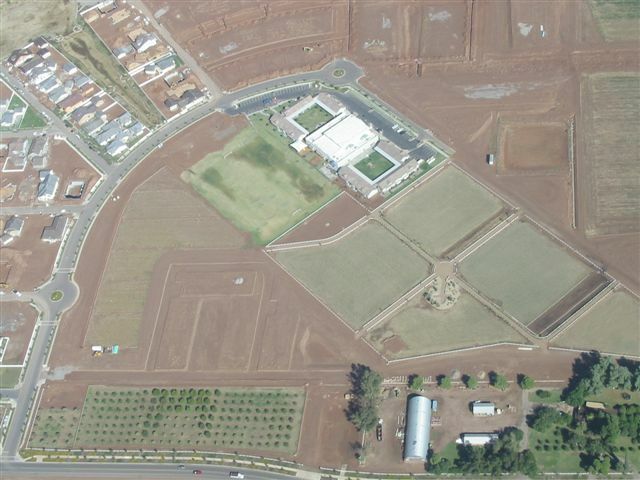 If you’re going to farm near urban areas, there’s a premium built into the land, which reflects the future value of that land one day being something besides a farm – a house, a mall etc. 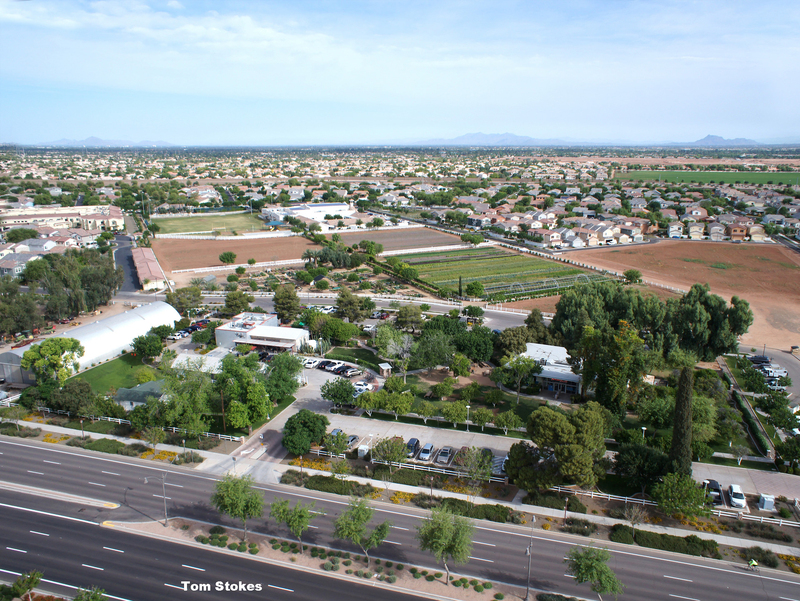 In this type of environment (suburban Phoenix), to afford staying in farming, only a few approaches can work . . .
A farming family or land owners will decide that the highest and best use of the land includes the continuity of heritage of farming vs. only considering the money. Municipalities, public utilities, or companies will set aside land they own for agricultural use. You convince a landowner or municipality that “highest and best use” for their land is more than just the dollar sign; it’s about long-term health and community vitality. Aerial view of Agritopia, 2015.